"The frightening, and most difficult, thing about being what somebody calls a "creative person" is that you have absolutely no idea where any of your thoughts come from really - and especially, you don’t have any idea about where they are going to come from tomorrow." 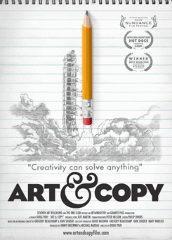 If you have any connection to "creatives" as they are called i the advertising business, then the new documentary film by Doug Pray is a must see. In his Lucid Plot blog, Jonathan Kahn writes a great do-it-yourself guide to Content Strategy for non-content strategist Web professionals. Great advice for when you find yourself in a project where you are pretty sure there is something wrong with the content, but you are not exactly sure what it is. Jonathan also beats the drum for Content Strategy as a professional practice with a very bright future. Finally, a commercial- or career-oriented reason to get involved in content strategy. Listen for a second. That crashing sound you hear is what we used to call the media industry, collapsing around us. All that destruction leaves a lot of space for web content. 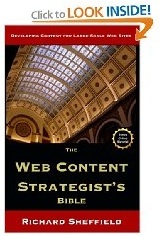 Web content strategy will be in demand for years to come. So get out there, and Do It Yourself." Using Facebook fan pages is a huge opportunity in the social media space and I'm just starting to get my hands around what you can actually do. The key with Facebook is to communicate. Ease up on the hard sell and don't forget what FaceBook is for - keeping up to date and communicating with friends. Here is a good place to start when trying to figure this out.